During the course of my holiday food shopping, I picked up a package of dates and meant to use them in something for the Christmas feast, but just didn't get to it. 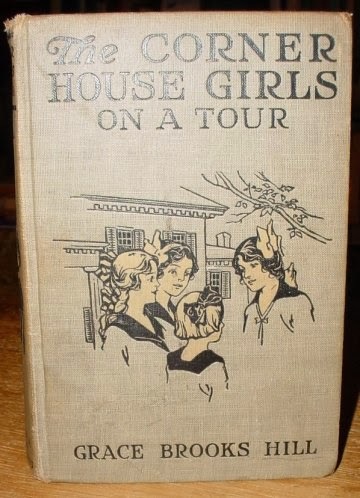 They've been stashed away in my kitchen cupboards since but after skimming a charming antique children's book, The Corner House Girls on a Tour, by Grace Brooks Hill, I was inspired to get cooking with them. **As an aside, a used bookseller skims a lot of books-partly to figure out where to shelve them and partly, because we are magpie readers, visually attracted to all kinds of books that we want to place strategically around our bowers. I read 1-2 books a week but I estimate that I skim parts of at least 100 books a week. "Ruth, the eldest and most sedate of the sisters, was filling sandwiches at the dresser—and such a variety as there was of them! Chicken, with mayonnaise and a lettuce leaf; pink ham cut thin and decorated with little golden dabs of mustard; peanut butter sandwiches; nut and cheese sandwiches, the filling nestling in a salad leaf, too; tuna fish, with narrow slices of red, red Spanish peppers decorating it; and of course sardines, carefully split and laid between soda crackers. What picnic lunch would be complete without sardines?" It all sounded like such a delightfully old-fashioned repast, and made me have a hankering for a nut and cheese sandwich, most specifically a slice of date-nut bread spread thickly with cream cheese. 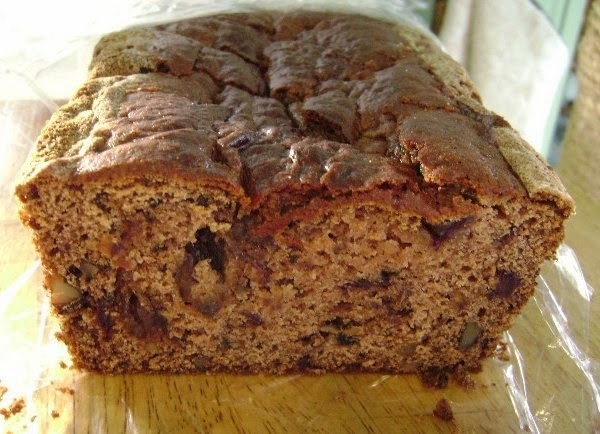 My trusty Betty Crocker Cookbook (1996 version) had a quick recipe for Date-Banana Bread, which I halved, switched around and made gluten-free into a tasty loaf that was moist and substantial. Grease one loaf pan with shortening. Pour boiling water over dates to soften. Meanwhile, mix sugar and butter in a large bowl. Add eggs and vanilla and beat until smooth. Mix dry ingredients in another bowl and well blended and then toss in the nuts to coat them. Mix dry ingredients into the butter-sugar mixture. Stir in soaked dates and water and mix everything well. Spoon batter into greased loaf pan and bake in a preheated 350 degree F oven for one hour, checking with a toothpick to see that it comes out clean. 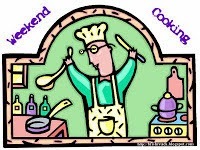 If batter clings to the toothpick, keep checking at 5 minute intervals to test for doneness. 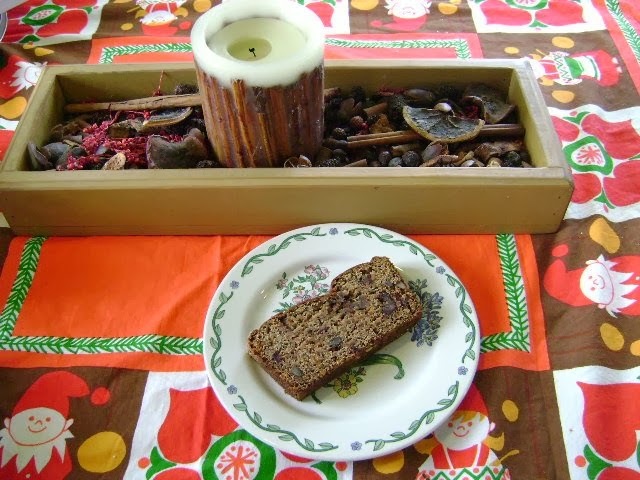 I am sending a slice of this luscious tea loaf over to Weekend Cooking at Beth Fish Reads, a weekly roundup of food-related posts. I also want to remind everyone of the giveaway that I have of two new gluten-free books back at this post. Deadline to enter the giveaway is March 5th. Love the quotes about the sandwiches. I love date and nut bread -- especially with a soft cheese. Yummm. This looks good! My husband has been adapting recipes to make them gluten-free, but I like to have a recipe to follow. I'll try this one soon! "Magpie" readers! LOL I love antique and vintage books. Great inspired bread, Rachel! I bet you come across some fascinating books at the bookstore! I love browsing random books and even just handling them. The date bread looks delicious! Oh, I'm with Beth - I'm imagining your bread with lovely slices of cheese. YUM! You can send me a slice of that bread too! Looks wonderful!